The 2011 Kia Optima backs up its standout styling with driving dynamics and an equipment list that outclass most of its competitors'. And price is still a strong suit. It is a great car for the money. The 2011-2014 models had an engine recall. The interior seat materials are not of the same quality as some it is materials. The nose is too long. It drags on hilly driveways and I do not feel like. I can get the seat high enough to see over the dash properly without my head brushing the ceiling. With all of these things being said, I love this car. It is a fun drive for a sedan, it is absolutely gorgeous and a decent car for the money. We have had no mechanical issues with it, other than the free, new motor at 100, 000 miles. Kia is standing behind it, but it's not happening very quickly. I love that it has a double sunroof and heated and cooled seats. I bought it used with a 175,000 miles, but it was a one owner car driven on hwy miles. However, it did start using oil and has been determined by Kia to be under warranty. They have agreed to replace the motor. My only complaint is that apparently the motor is on back order and they don't know when it will be in. Therefore, I have already been without my car for 3 weeks and don't know how much longer it'll be before I get it back. 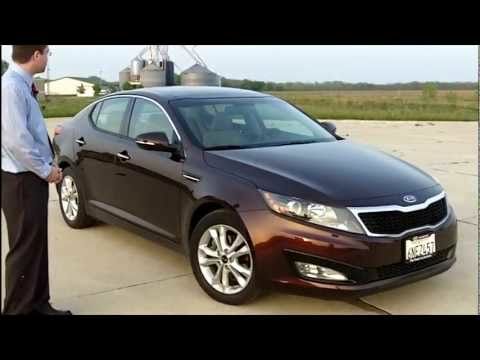 2011 Kia optima ex fully equipped options. I absolutely love my 2011 Kia optima ex! The color is white with the top being black and having a panoramic sunroof. It is equipped with fully loaded options. It includes a backup camera, heated steering wheel, heated and cooled front seats, heated back seat, two savable seat settings, Bluetooth, navigation, Sirius XM radio. Steering wheel controls that include radio volume, radio control, odometer settings, phone answer and end call, cruise control. Also the infinity audio system for optimal sound.